Anguilla Golf, Temenos Golf Club, Anguilla B.W.I. Cap Juluca has announced that they now manage Anguilla's only 18 hole golf course, a $50 million creation of Greg Norman, the Temenos Golf Course which Cap Juluca reopened in December. If you are looking for that great Caribbean golf experience, Anguilla golf is back in play. Enjoy full days of Cap Juluca's signature hospitality at Temenos Golf Course, a 7,063-yard championship course that was designed by golf legend Greg Norman and first opened in 2006. It offers dramatic elevation changes, water features on 13 holes and, with the help of Cap Juluca's brand of hospitality, guests can enjoy one of the finest Caribbean golf experiences. 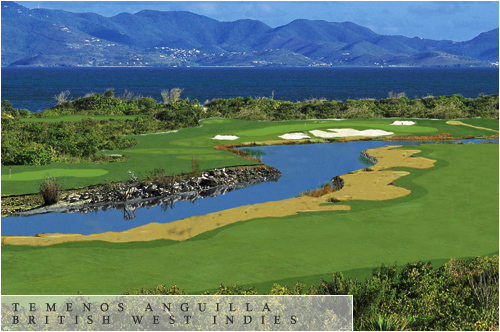 Robb Report called the first hole at Temenos Golf Course, "The Caribbean's answer to the 18th at Pebble Beach." Tee times are now being accepted by calling the Temenos Golf Pro Shop at 264.498.5602. For the 2010 season, the greens fee for a round of 18 holes during peak times will be $225+ per person.